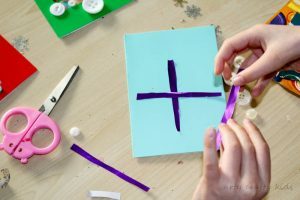 These gorgeous DIY Christmas Cards are incredibly easy to make and are perfect for kids to make themselves. 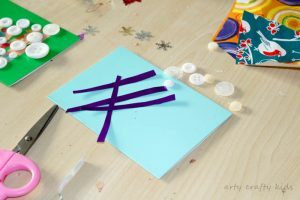 We set up our own creative station at the dining table using pre-made cards, buttons and scrap paper and turned our Christmas card making into an activity for the whole family. It was great fun and if you intend to send multiple homemade Christmas Cards, then this might be the way forward. As my family live far and wide, all of our Christmas need to be posted rather than hand delivered and for this reason, I used a pack of coloured pre-made cards and envelopes. Using straight strips of scrap paper, we created four designs: A Christmas Tree, Bauble, Star and Snowflake. 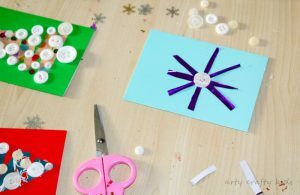 This tutorial will show you how to make a snowflake, which will give you the basic method to create the other designs. To begin, simply cut a four strips of coloured scrap paper. 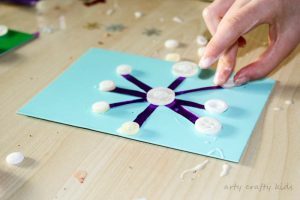 Using PVA glue, stick the paper onto the card to create a cross and then a star. 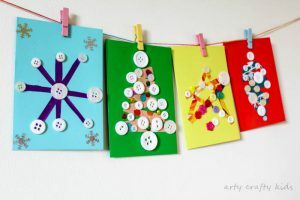 Using a selection of buttons , stick them directly onto the snowflake. Add as many buttons as you like and maybe a few sequins for some extra sparkle! While my elder daughter favoured simplicity, my preschooler preferred a colour and some random positioning, which highlights the beauty of this simple craft – it’s open-ended and inclusive! 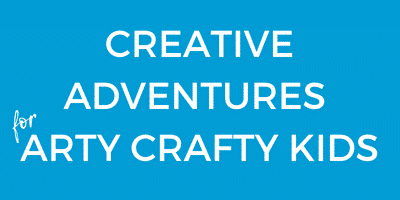 Whether you’re a toddler, preschooler, tween or a bigger kid (aka an adult), it’s one that everyone will enjoy. 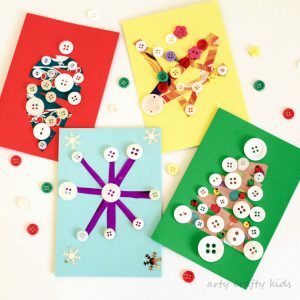 And if you need any more convincing, our DIY Christmas Cards will give those little hands a fine motor work out! For more Christmas inspiration, take a look at our gorgeous Rudolph, Paper Roll Elves and Easy Paper Plate Bauble Craft! Our DIY Christmas cards forms part of a gorgeous series of Kid-Made Christmas cards hosted by the wonderful Jenny at Mum In a Mad House. 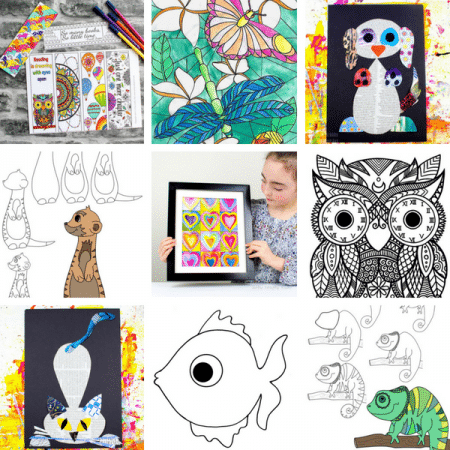 Click here to see all 30 cards!